Welcome to the tutorial on world building. If you’ve played along with the walkthrough you may be itching to try out making your own world and finding a new place to build your next dwarfy citadel (perfectly laid out – as detailed on the notepaper you doodled on at work all day). Well, you’re in luck, because that’s what we’re talking about today! World building is a subtle and arcane art in Dwarf Fortress. You can do it the easy way (default world generation), the slightly complex way (custom parameter setting) or the really hard way (world gen file manipulation). We’re going to be covering just the first way as the others make my brain hurt and I’m not a masochist! If you are interested in doing things the hard way you can head over to the wiki and check out the guides to advanced world generation and pre-generated worlds. Er, where was I, why do we want to generate our own worlds? Well, generally it is because we want to create a specific type of environment (haunted glaciers with skeletal whales FTW!) or we want to make sure we have an interesting and exciting place to build (build a volcano inside a fortress inside a volcano!). Or perhaps you just want to start a new game in a new land. You you like the settings, hit y and the world will start to generate. You’ll get a lot of stuff happening on the screen as the world is generated. Mountains will form and be eroded, forests will spread, rivers will spawn, civilisations will rise and fall. It’s pretty cool actually! Here’s a shot of the world history being generated, which happens after the geography is formed. Did you know you can actually go and read all of this history in Legends mode? Yes, it’s all there! Tons of history and mythology to soak in. We’ll have a look at that later. Once the world is created you’ll end up with a menu as well as a little information, such as the name of your world. Mine, The Universe of Wonder looks mountainous and pretty frozen up North! (I swear, I got that name the first time!) Use the arrow keys to look around and get a rough idea for the kind of world created. Hit Enter to accept the world. The world is now being stored and you will be taken back to the main menu. You can now chose Start Playing and a new world will be there, probably the attractively named (untranslated name), Folder: Region 2. With your new region selected, hit “Enter” and you can see the three game modes available. 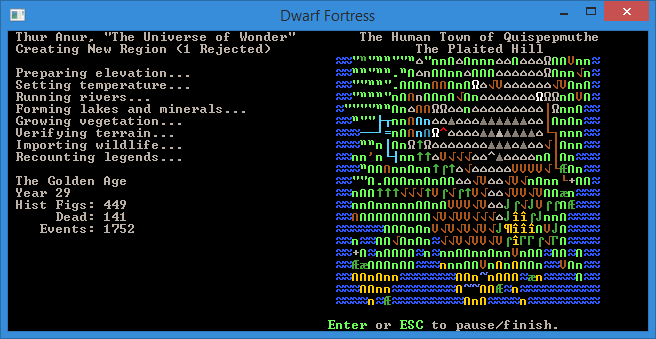 Dwarf Fortress, which you know well by now, Adventurer, which you may have dipped into and Legends. Select Legends and hit Enter. After some loading you’ll get a screen showing a list of histories to read. Scroll around, hit Enter to drill down and Esc to go back up a menu layer. The first history I read is about Sidya Athetipyi, hag spouse of evil - born an elf, abducted at age four, and transformed into a creature of the night by Momuz Shadeberry. She later escaped and wandered for years, before being struck down at age 41 in the Pure Prairies. There are happy stories too, I promise! If the in-game interface for Legends mode isn’t your cup of tea, don’t despair! From the main legends screen, you can press x, p, d to export most of the information - or use the DFHack command exportlegends all to do so automatically. 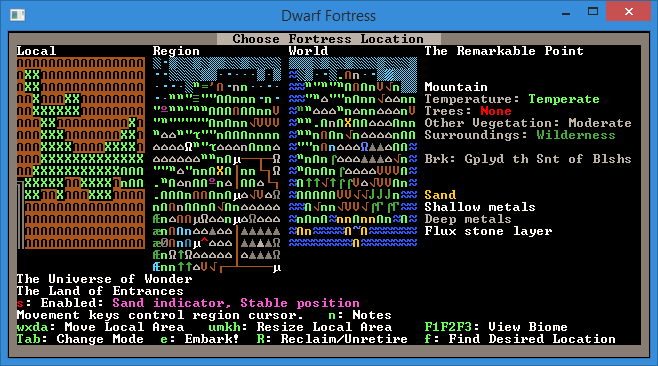 These files are created in the Dwarf Fortress folder, and can be read with Legends Viewer - which incorporates the maps, and adds everything from hyperlinks to population statistics. When you’re bored, Esc back out to the main menu. If you read the text on screen you’ll see you can move the local area box around using w, a, x, and d. Try it now! You’ll notice lots of information changing on the right. You can also resize the local space using u, h, m, k. You probably want to leave the box at 3x3, but 4x4 will give you more space when you’re playing. 5x5 should only be used by those who like the game going particularly slowly as those sort of sizes can become somewhat crippling for the CPU to keep up with. 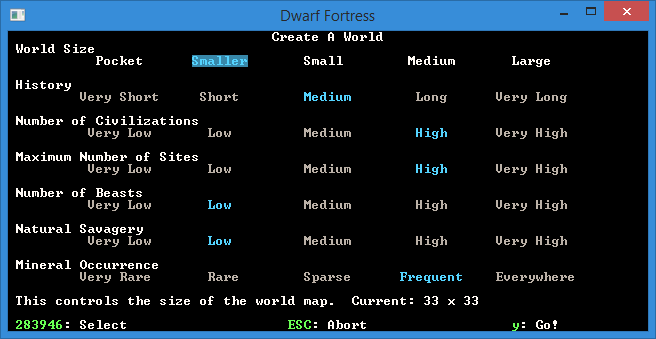 1×1 micro-fortresses are also doable, if you want speed more than space. Hit u and make your space 3×5. Make it small again by m. Easy huh? But rather than just selecting some random area and hitting e for Embark!, lets use the Find system to get us a nice site. Hit “f” for Find. A new menu will pop up with settings to fiddle with. Set Savagery and Evil to Low. Set Flux Stone Layer to Yes. Flux stone is one of the ingredients you need to make steel so we really do want it. Set Shallow Metal and Deep Metal to Multiple. Set Soil to < Deep. Hit Enter for Do Search. DF will now look for a location matching your preferences. Now, I’ve chosen the particular settings above to set up a fairly straight forward fortress location. You can have a lot of fun by not going for some of these settings, so don’t be afraid to experiment. Once the search is run a suitable site will be found (hopefully) and the local map will be centered on it. Hit Space to back out of the find menu. Here’s what I’ve found. You can see the climate looks quite good. The temperature is warm, it’s sparse trees (which is plenty). It’s wilderness, which will be somewhat challenging and fun and there’s some sand too – always nice if you want to make glass. However, one thing I don’t see is an aquifer… or do I? Perhaps it’s in another biome? Biomes are how land is divided up in DF. Plains will be one biome, a mountain range another, a forest yet another. Clearly there’s a grassland biome here, and there are three options next to View Biome; F1, F2, and F3. By default we’re viewing the biome that dominates this space inside the local embark box and this is the F1 biome. if I hit F2 I will switch to seeing what’s on the other biome as well as what land it covers. The flashing Xs show the boundary and I can hit F1 to see how it compares to the other biome. Here’s what I see when I check the second biome. Note, it’s possible to have one, two, four or even more biomes all intersecting on the area you’re looking at! I’m pretty pleased with that! 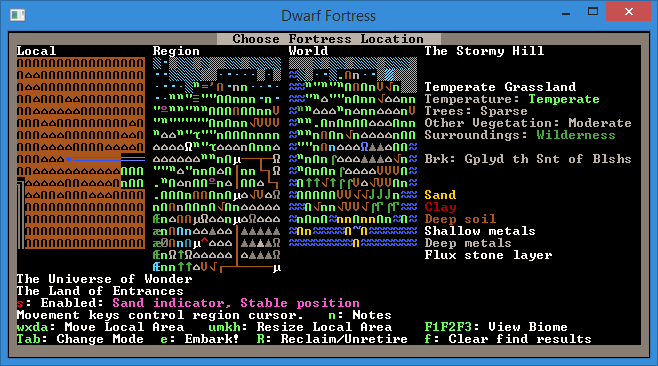 A good sized area, a water source in the corner, magma (deep down), sand, flux stone, lots of wood, perfect! Of interest is that I have a brook instead of a full river (DF tells me that in the info box to the right of the maps) which somewhat reduces the difficulty of dealing with the challenges of plumbing! The best option, if you want to play straight away, is to select Use DFVIDTUTS2015 (the preset the walkthrough is based on) and hit enter, you will now be taken to another menu which you want to hit e from. Voila! You’re in and playing! 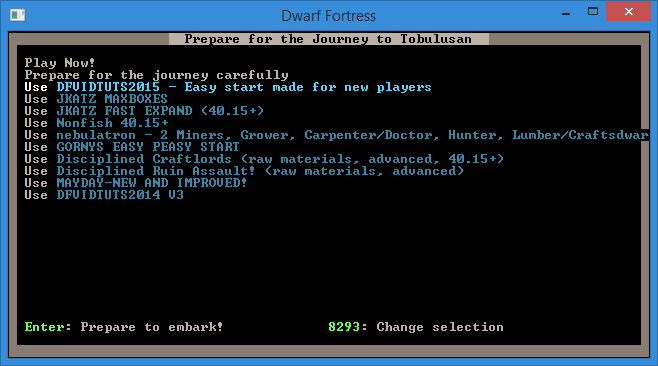 Alternately, you can Prepare for the journey carefully and individually skill and equip each dwarf - but that’s another tutorial. Righto, you should be able to do basic world construction to your heart’s content now. World generation is as complex as you want it to be and you can see some of those options under Design New World with Advanced Parameters from the main menu. Don’t worry about those unless you get super keen on custom building worlds to ensure certain features, in which case, head off to the Bay12 forums already! There are lots of useful threads there and links to map databases (and info on how to use them). It’s a hobby in itself and people seem to enjoy competing to create the most perfect starting location or the most perfect micro-fortress.